Just realized you could troll someone pretty hard by using a sign to claim their chest and lock them out of it before they do. But I can't think of any way to protect against that. I like LWC but its becoming too ... heavy lately - I may have to give this a go. The number in brackets at the end of a plugin's subject is the required build version. For Lockette, this is . @Acru "Would protecting doors this way be easy to implement? (Looking into this.)" Just wanna give some good tips if you start looking into this, gotta be redstone/button safe, block it stands on gotta be safe, block sign is on gotta be safe. And I really would love this, another plugin used that sign way before but has changed into database now which instantly started to bug with losing owner values and such. Updated craftbukkit to 325, and it works now. Thanks Acru got the great mod! Yes, but presumably you would make a chest private before you put anything valuable in it. I am considering hooking into permissions plugin, and via that allowing full-powers admins to break such locks. On a more secure server with cuboid-like permission zones, you can prevent placing a sign, however? The former might be a problem for blocking redstone, but hidden. The latter would mean the sign would appear to be 'blocking the way' on the lower half of the door, but you can walk through it. As redstone can activate any door, it may be required to disable redstone activation, and as iron doors can't be opened manually, it would mean wooden doors only. I do agree, that plugin I mentioned only has got wooden locked as well. Whenever you try placing a button, redstone torch etc close to a protected door, it hops instantly back into inventory. I am currently using build #339 and it does not work for me. I went back and tried the 335 and 235 and they dont work either. Please help me! Be sure the Lockette.jar is directly in the plugins folder and not a subfolder. Ok so why there's a need for case insensitive checking? As far as I know, all authentication plugins are case sensitive and we could use that to exploit the plugin. Or perhaps I am completely wrong. 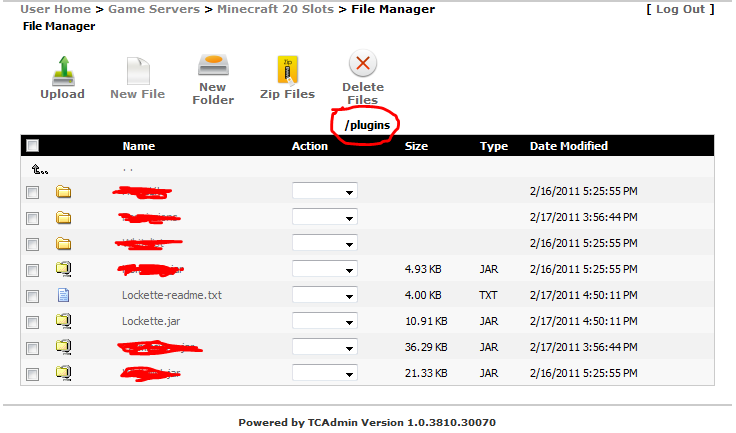 The Jar file is directly in the /plugins folder. Note: I am running the server off a dedicated server but i dont think that makes a difference. Doing the checks insensitive to case allows you to be more lazy when entering text on signs, so you can type mrbighead instead of MrBigHead. Makes me wonder about other uses for this clever technique of yours. Chest shop has been suggested, and that would be sweet. But what about zone protection? Lets say you have a city, and within that city there are several lots. This would protect 100 blocks in each directions (NESW) from the sign, for a total area of 200x200, from bedrock to sky (64 down 65 up). Then within close proximity of the [ProtectionCity] sign, one could add several [More Users] signs to allow for more vice-mayors. This would allow JohnTheCitizen to build on his private lot (but not in the [ProtectedCity] sourrounding it). His lot size would be 10 blocks north, 10 blocks south from the sign. And 7 blocks east, 8 blocks west, for a total lot size of 20x15. Also he would only be allowed to dig 20 blocks down, and only build 15 up, since he doesn't have permission to the area above and below. Using the above [ProtectionLot] sign out in the open (outside the protected city), would still protect John's lot. But not limit him from building larger/deeper/higher, althought that area would not be protected. @Acru So I was completely wrong. Installing and testing right away! @Acru I tought about one more issue. What if we have an username with more chars than the signs char limit? Unity - Trade your stuff! What if we have an username with more chars than the signs char limit? The plugin will check only the first 15 characters of a user name. I had considered this a possible security issue, though only applying to two people who have 15+ character user names where the first 15 characters are the same. Do you consider this acceptable? For this plugin, that just means keeping an eye on signs, chests, dispensers and furnaces. Lockette knows for certain which sign is related to which container by the direction that the sign is facing, making the search fast and a constant time. For areas greater than perhaps 4x4x4, with non-unique blocks, this method becomes impracticable. I believe that a database is appropriate for larger protection zones. I see, so I guess there is no way to feed the plugin some coordinates and tell it to ignore which block types is within the area, just protect everything. Well, I really like your concept. Thumbs up. Too bad it won't work on a larger scale. I can't wait for the trade system @Acru , I like your style and your plugins are good for larger servers. So many admins don't understand how much slowdown there is when scanning through a is it an array its called? having 5,000 protected chests ohhh boy I remember I use to report such slow downs in plugins and they all tell me I'm lying haha. @Acru We know nothing is 100% safe, and I think that's acceptable. Once I saw a plugin that locked a chest forever because the username had 17 chars. By the way, the plugin is awesome. Works like a charm. @Acru I don't know I must have been drunk but could you add permissions or I don't care a config file to add super admins to the list to look and break chests of other peoples. I never even looked maybe this was in already haha. I think I'm dumb for not bring this up before its a must have thing to clean up old chests or possible grifed chests. I'm splitting programming time between Lockette and the new plugin, however. The version will be 1.2 when I have this and a couple other things in. Agreed, latest version does not work. You are using a Craftbukkit build between 311 and 318. Build 323 or greater is required! Okay thanks. Looking forward to the new plugin i think this one here is pretty much done anyways soon. 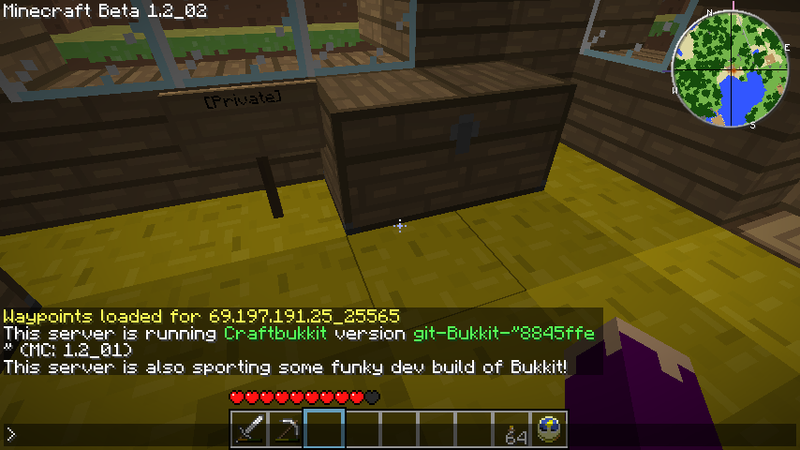 Besides the permissions I guess and then maybe permissions one more time for bukkit once it comes out hehe.